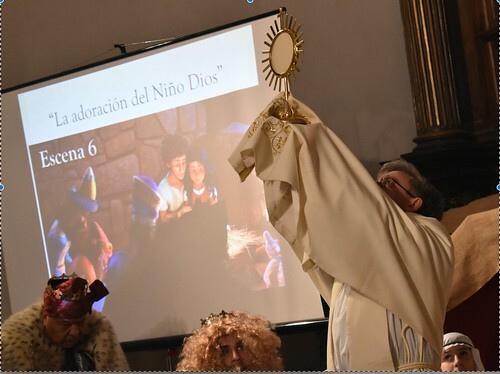 In this year’s Christmas program in Villalbilla, we put on a play that confused the audience in the beginning, but by the end they began to understand the meaning behind it all. After each scene the kids from CCD sang Christmas carols that they had prepared for the Baby Jesus. The actors from the play and even some of the parents also sang a Christmas carol for Jesus. The story begins after the Roman soldier announces the census decreed by Caesar Augustus, and the Blessed Virgin Mary and St. Joseph go to Bethlehem in the city of David. When they arrive, they find a house that has a lot of noise coming from it. It is the Inn of Noise. Joseph knocks on the door and a mother answers with her apron on because she is cooking and vacuuming all at the same time. Her two children are in the house listening to music, one with headphones on and the other listening to music blasting from the speakers. On the other side of the house the dad is watching a soccer game and every once in a while you hear him shout “GOAL”! The mother tells St. Joseph that there is too much noise in the house and it is no place for a baby to be born. Finally, Mary and Joseph reach Bethlehem and the time for Jesus’ birth arrives. The angels announce to the shepherds, “Glory to God in the highest”. The shepherds go to present their gifts of wool and honey to the Good Shepherd who was born in the cave in Bethlehem. The Kings offer their gifts of gold, frankincense and myrrh to the King of Kings. Afterwards we all sang “O Come Let Us Adore Him” while Fr. Juan exposed the Blessed Sacrament. Bethlehem literally means “House of bread”, and in Bethlehem the Living bread came down from heaven and Jesus in the Eucharist becomes our nourishment. We all adored Jesus present before us in the Eucharist. The actors from the first Inn, the Inn of Noise, went before the Eucharist and left a lit candle before Him. Only in silence can God speak to us. The actors from the second inn, the Inn of Technology, turned off their cell phones and tablets and left their candles before the Blessed Sacrament. “Speak Lord, your servant is listening”. The Father from the next Inn who was dressed as Santa Clause took off his hat before the Blessed Sacrament and the mother and children went with gifts for the Child Jesus, present in the Eucharist. We all adored Jesus in the Eucharist and Fr. Juan gave us the blessing with the Blessed Sacrament. Now it's your turn to think: What kind of Christmas did you celebrate?